What ever did we do before Pinterest? I’ll admit I still tear pages out of print magazines, but clicking the Pin it button is so much easier. This was on one of my boards for quite some time before I found the fabric and lace to copy it. Of course the model has about 8 inches on me and mostly legs. I’m 5 foot 2 inches after I do the stretches my yoga teacher claims make you taller (temporarily). The McCall’s flounce fit onto the Vogue skirt without any adjustment, like they were meant to be together. The waist band is just a strip I added, using black petersham ribbon, covered by the lace. I thought the black alone would stand out too much. Both the knit fabric and the lace were from Haberman Fabrics, where I also learned a technique for the lace. 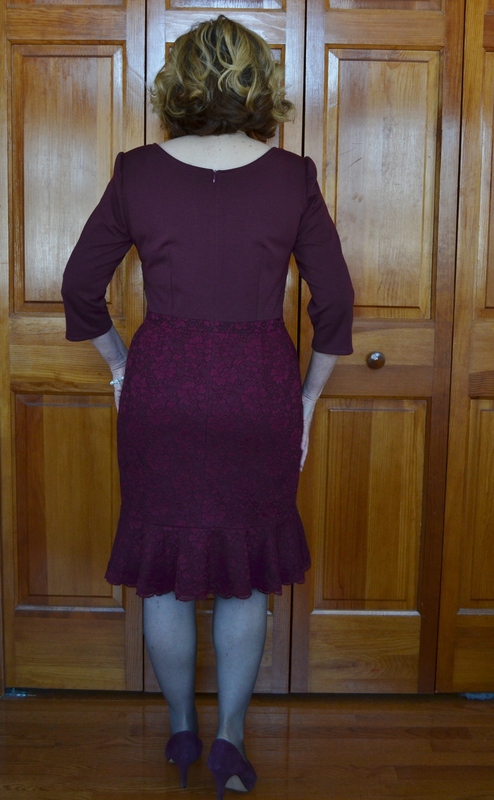 To avoid bulk, I sewed the skirt’s waist darts, as marked, only on the knit fabric. The lace in then laid over it and cut along the lace’s pattern to match the length of the dart. The two edges are overlapped to follow the dart’s shape. To stich it in place, I used a line of machine stitching to hold it in place and hand stitching to secure the edges. 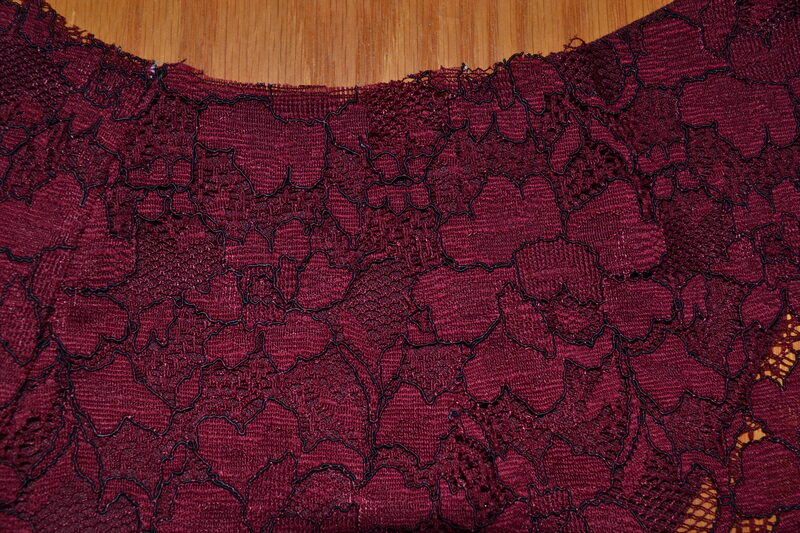 The photo below shows, on the left, what a dart would look like sewing the lace and knit as one fabric. The right side shows the dart in the knit and lace cut along the lace’s pattern. Using this technique, the dart almost disappears. 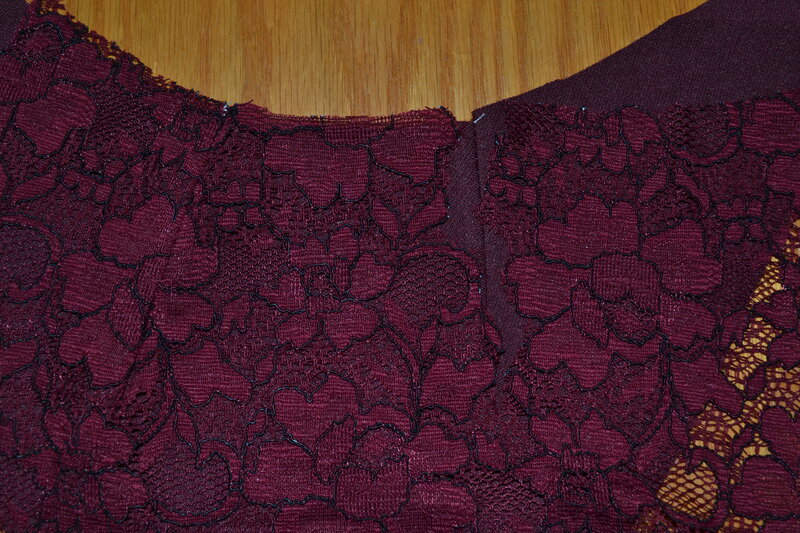 I also cut the scalloped edge of the lace and attached it to the bottom of the flounce, using the same technique. This allowed me to adjust it enough to follow the curve of the flounce. 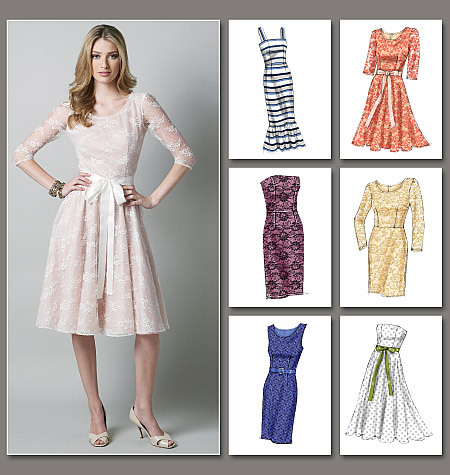 For the side seams of the body of the skirt, the lace and knit are sewn as one fabric. 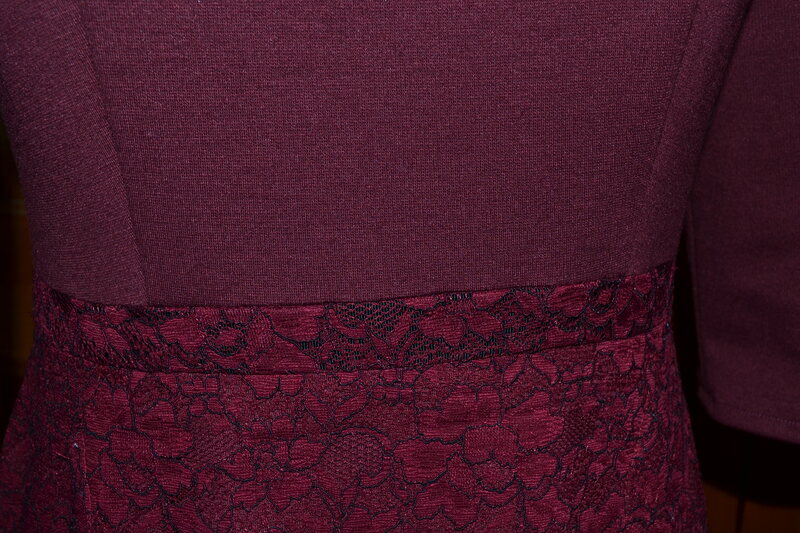 For the flounce, the side seams of the knit and lace are sewn separately, with a French seam on the lace. Now comes the lucky part. 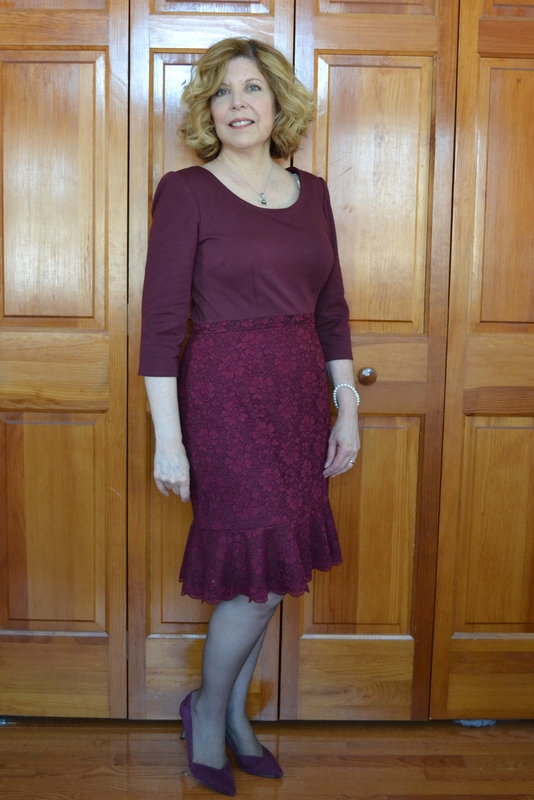 I made the dress to wear to a dinner dance for a local children’s charity. It is an event we have attended every year for at least the last 10 years. I always buy some raffle tickets, but have never won, which is okay, it’s for a very good cause. This year I won something for the first time. 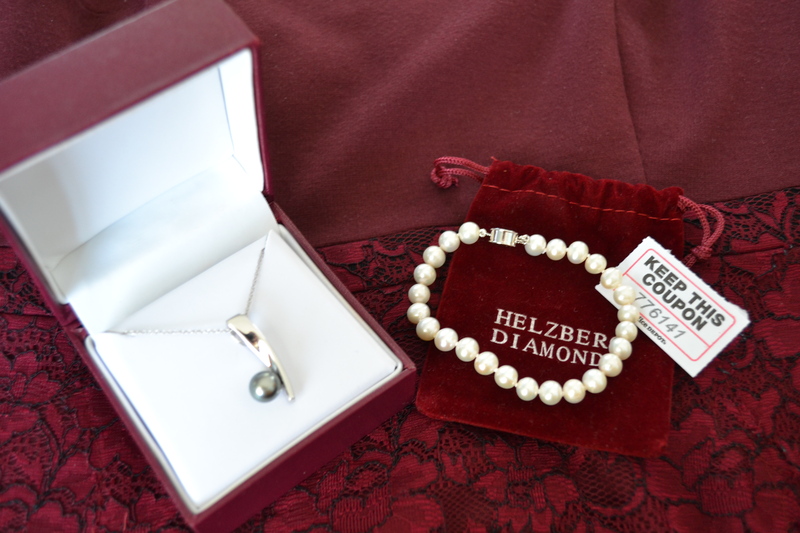 A lovely pearl pendant and bracelet. The box and pouch actually matched my dress. What luck! Stunning dress in beautiful colours! Thanks for sharing the lace dart technique, I had never seen it before. You’re right about Pinterest, it’s on one of my boards now for future reference! Thanks. I hate to admit how much time I spend on Pinterest. It’s just too easy to get lost in it. This is beautiful! I love the colour! And that prize… It was meant to be. Thanks. the funny thing is the jewelry turned out to be donated from a store managed by my daughter’s boyfriend. He had no idea i was attending the event. So yes, it was meant to be. Thanks, I look forward to getting it back out in the fall. On to spring and summer colors now. Absolutely stunning, and even lovelier than the inspiration! 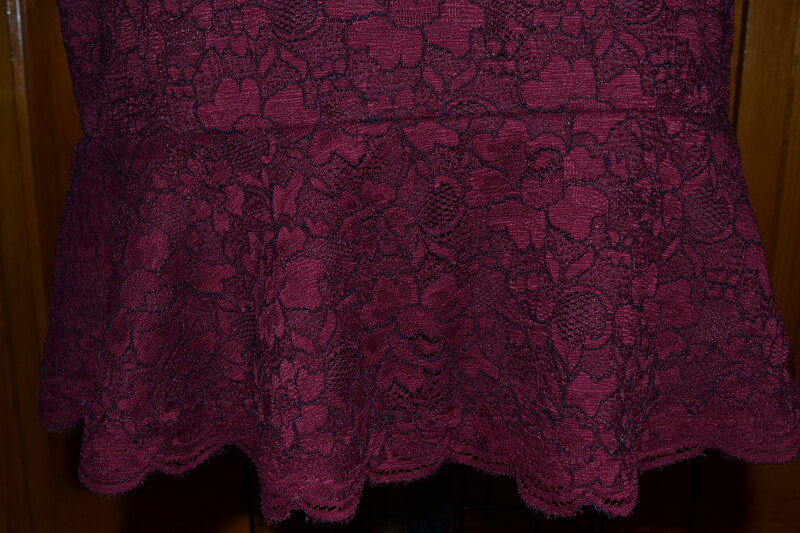 I just love the color of the lace and how saturated it is. That dart technique is wonderful, too–thank you for sharing. And lucky you, winning those pearls! Thank you. I really love the burgundy-bordeaux-marsala-maroon color family, it’s a color that warms up winter. Now it’s on to spring colors. The bracelet has become one of my favorites, I even added a little charm to it. Congratulations on a stunning outfit and also on winning a prize! I bet Amanda will be drooling over your lace number when she reads this post! Thanks and Amanda definitely is the Duchess of Lace. Ah! Such an elegant colour! Such a clever idea! I love it when I can mix and match and come out with exactly what I want! Congratulations on your win, with the dress and the jewellery! Thanks. Although I am really ready for spring and summer clothes, I’m a little sad putting away this dress. At least I can wear the jewelry all year round.